It’s a new day. Time for a fresh start. Even when we are loving life and things are going well, there is always room for change. One of the most important things we can do for ourselves is to constantly keep learning, exploring and sharing. Each morning, ask yourself this question: How can I make today better? You can make it better for yourself. But you can also make it better for someone else. So many opportunities; so many chances to make a difference; so many things to learn. 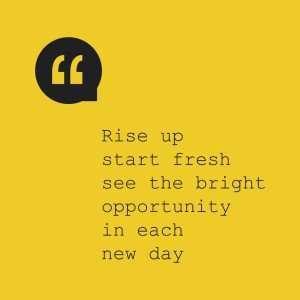 Right now is your time for a fresh start. What will you do?